Artistic Statuary can help turn your home and garden, or place of business into a work of art and the envy of your neighborhood. While you may look at your yard and see a plot of grass, we see exciting possibilities – much as an artist sees a blank canvas. Whether you are looking to add accent pieces to your current design, add a splash of color to your décor, create an entirely new design around a fountain or just looking for ideas; we offer almost unlimited choices to assist you with your plans. Our own manufacturing facility enables us to produce a complete line of Cast Stone Planters & Urns, Wall Fountains and Free Standing Garden Fountains, Columns, Table Sets & Benches, Balustrades, Finials, Pergolas, Statues, Wall Décor and Lawn & Garden Art. Our craftsmen create elegant works of art that are exquisite in their beauty and attention to detail. 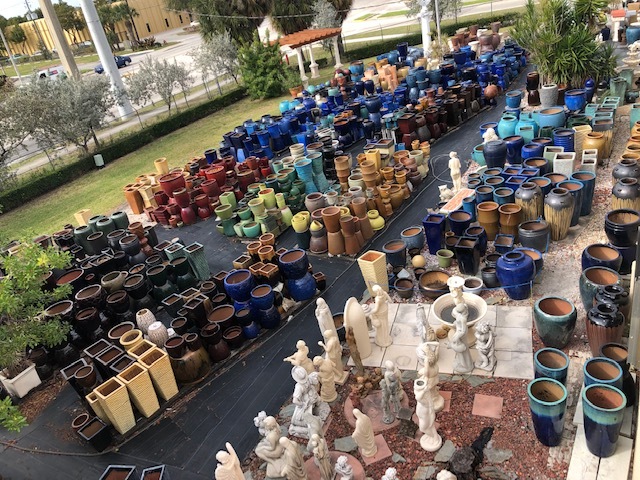 In addition to our extensive line of Cast Stone Products, we are direct importers of Vibrantly Colored Glazed Planters offering a huge selection of colors and sizes to choose from. Add our Talavera Hand Painted Mexican Pottery collection, Brass and Bronze works of art, Italian Clay Planters and we think you will find something for every taste and style. Can’t find what you are looking for? Let us help you…with over 35 years of assisting our customers, we have the experience and resources to help you find exactly what you need to complete your perfect outdoor garden setting.